Georgian architecture. 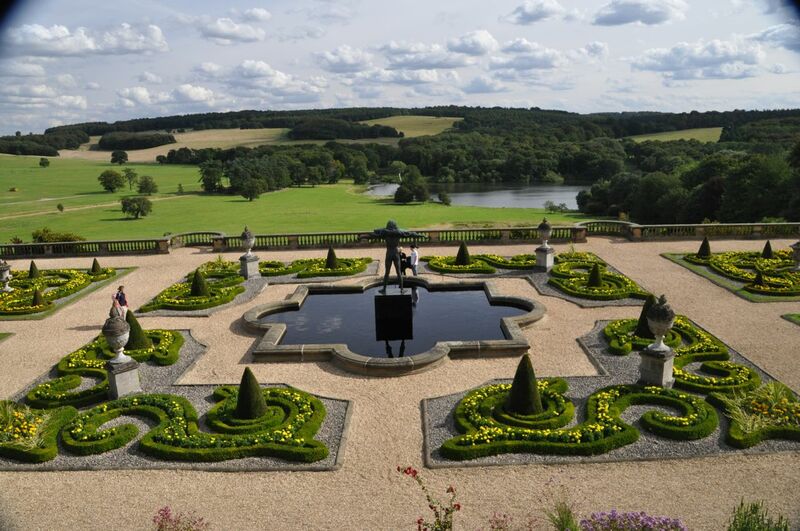 The Earl Edwin Lascelles wanted nothing but the best and employed the finest craftsmen of the time: architect John Carr, interior designer Robert Adam, furniture maker Thomas Chippendale, and visionary landscape gardener Lancelot ‘Capability’ Brown. That backyard, shown below? No, not that simple patio garden in the foreground, silly, we mean the trees and lakes going off into the distance in all directions – that’s all Brown’s landscaping and tree planting, making it look manicured but natural, just so. With regard to expenses: “Let us do everything properly and well ….” The place defines filthy rich, with Renaissance masterpieces, exquisite family portraits by artists like Reynolds and Gainsborough, an enormous collection of Sèvres china – a lot of it previously owned by Kings Louis XV and XVI (and some ordered by Louis XVI but not delivered due to a decapitation problem), etc etc. 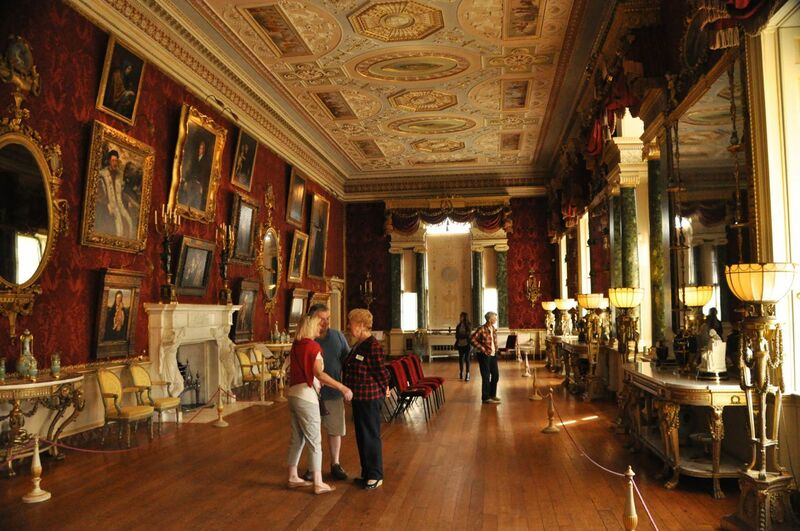 Today Harewood is one of England’s “Treasure Houses”, a consortium of 9 of the foremost stately homes in England still in private ownership that market and promote themselves as tourist venues. The Lascelles – Earl and Countess of Harewood – still live there, but since the place is beyond huge, we’re sure they don’t miss the area accessible to the public – although even that area becomes available to them after hours and in the winter. So let’s take a peek at the life of the English aristocratic rich …. We’re starting with the OMG ceilings, each room different, each designed by Robert Adam, with a rug designed to complement it. Of course the wallpaper and rugs have been restored now to reflect what it would have been; the fireplaces are original and the ceilings have their original plaster work (though it has been repainted). It’s impossible to really get an entire room in a photo and still see the incredible detail, as illustrated in the picture to the left, so we’ll just show some of the ceilings. We think you’ll agree, they’re pretty incredible. Of course you need to add the full-room floor rug with a pattern that’s riffing off the ceiling design to get the full effect. Apparently if one has a lot of money, there’s nothing to do but collect expensive things, and then show them off (flaunt? ); so there are a lot of collections on display, such as ladies fans (from the days before air-conditioning). There were lots of fans (! ), so we’ll just show a few that impressed us. Chippendale. Ah, to avoid repeating “from Chippendale”, let us note that every piece of furniture in the house was designed and made by Chippendale! The Chinese wallpaper, from the 1760’s, is spectacular. It’s the original; out of favor in the early 1800’s, it was cut from the walls and stored away – for 200 years, and nearly perfectly preserved. Hand-painted on fabric made from mulberry bark, it’s a continuous landscape of traditional Chinese rural life. 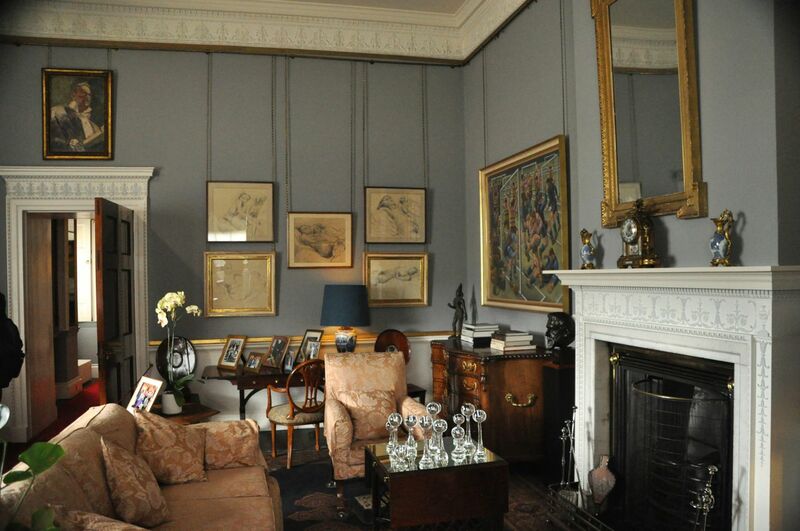 Next is Lord Harewell’s Sitting Room. Every room has a unique fireplace, and above that, usually a large mirror slightly tilted so that it reflects the fabulous ceiling. This room has some line drawings of unclad females, but also has some pretty fabulous paintings – like J.M.W. Turner (1789) – who painted the Harewood mansion (! ), Thomas Girtin (1801 – you probably don’t know him [we didn’t]; he outshone his friend Turner and played a key role in establishing watercolor as a reputable art form, but he died young), and two paintings by John Singer Sargent (1905, 1913). used infrequently. The bed and furniture are Chippendale, of course – and they’re spectacular. 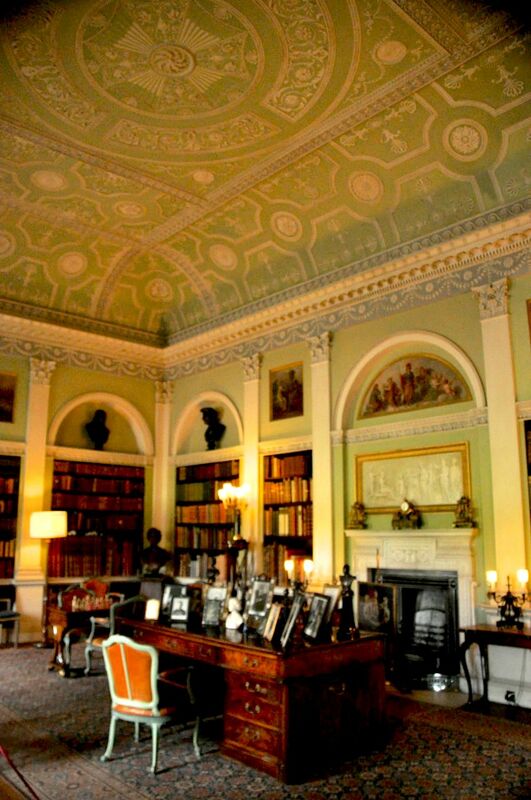 Next is the Main Library, a Victorian room with imposing mahogany bookcases with brass inlay and marble chair rail. 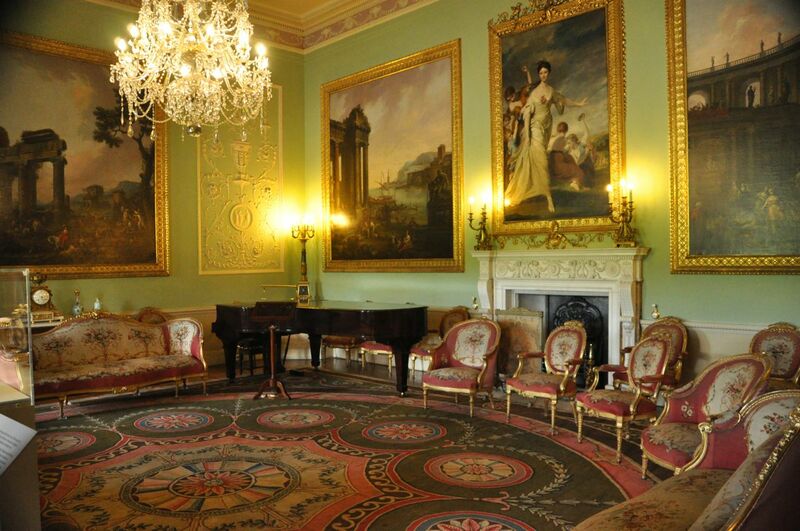 Then the Yellow Drawing Room – not too shabby. The porcelain throughout the house is astounding. 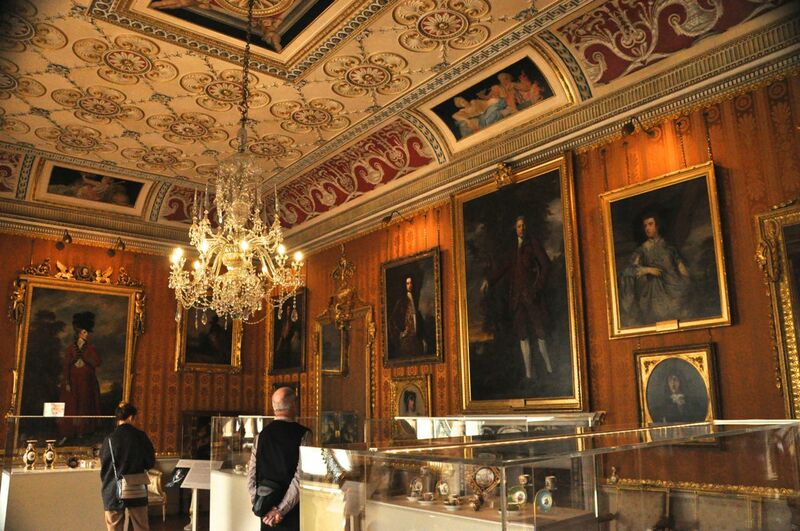 The Cinnamon Drawing Room is enormously long and houses a lot of collected treasure. Edwin Lascelles – and his son after him – had an eye for beautiful objects and a bank account to support expensive tastes. Maybe you noticed the Chinese pottery in nearly every room shown so far – like the Ming vases in the Main Library above. How about these next gems? The first vase below (French, 1740-1760), has a Chinese celadon glaze, a dolphin body, a ram’s head below the spout, and serpent handles. how about having on your wall a Bellini, or Filippino Lippi, or Titian, or El Greco, or Jusepe de Ribera? Finally – for this room – the china. How boring, you say? Well, a short history lesson is needed! When Louis XV moved the government and court to the Palace at Versailles, it became the center of society, art and fashion. The King (and his mistresses Madames de Pompadour and du Barry) commissioned the greatest artists and craftsmen of the day; in particular, their patronage of Sèvres porcelain was key to that factory’s success. After the fall of the Bastille, the new government confiscated and sold the art, and France’s finest made its way to the wealthiest families in Europe. In England in the early 1800’s, French style and culture was the fashion, and Sèvres porcelain was one of the more prized possessions. 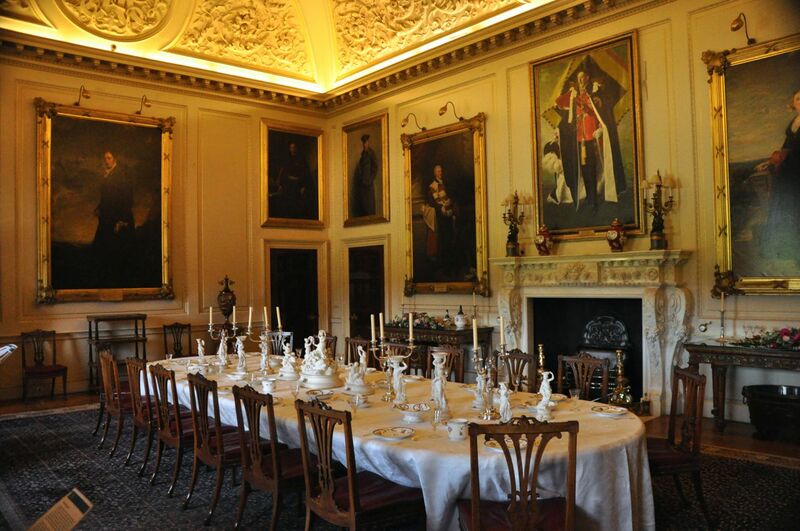 Here at Harewood, there is an entire hall of this porcelain in display cases, so many different place settings that one gets tired looking at it. That’s in addition to a room where some of the best is displayed, and where looking is much less tiresome! Here are some examples – and some from the table of Louis XVI and Marie Antoinette, delivered a year before their executions. They are spectacular. Just because I thought it was gorgeous, here are pictures of a cabinet from that room. 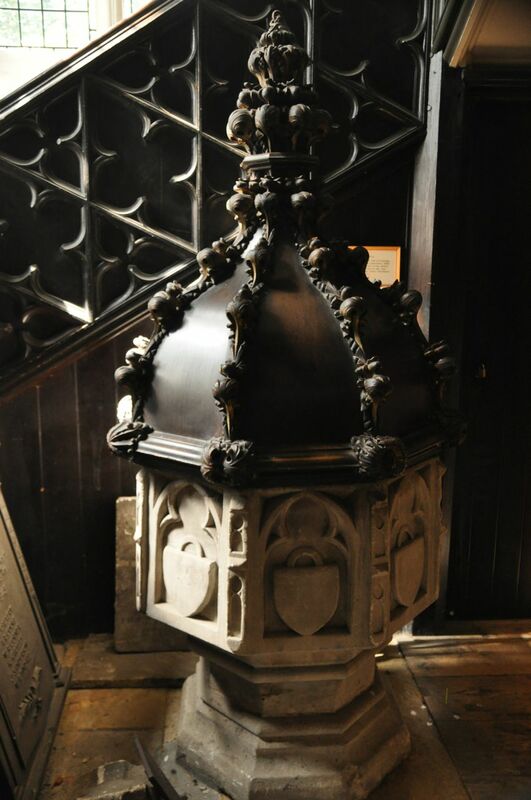 Chippendale furniture is remarkable; the (urn-topped) pedestal conceals racks to keep plates warm; the urn itself is lead-lined, to be filled with ice to keep beverages cold. That oval “cellaret” beneath the (superb) side-table? That’s a lead-lined wine cooler for use during the meal. Finally, the Music Room. It’s pretty much unchanged since 1771. The Chippendale inlay on the furniture (shown below) is amazing. The vase, Sèvres of course, is from 1770. I guess I have mixed reactions to this incredible extravagance on display. Look simply at that Chippendale inlay above. Every piece of furniture in the house is like that. Really? Every piece? When is enough enough? Is “Because I can” a sufficient justification for doing? Primarily I am repulsed by the need to own 1,000 pieces of Sèvres porcelain dinnerware and the total output of the Chippendale factory for several years. On the other hand, would these beautiful items be here for us to see if not for the extravagance of the rich? Haven’t the arts almost always relied on rich supporters? I remain ambivalently repulsed. Then again, out of curiosity I queried the internet on how the Earl Edwin Lascelles made this incredible fortune that his heirs continue to enjoy to this day. Funny, the Visitor Guides and brochures don’t say a word about that. The Earl made his fortune in 3 areas: in “Customs positions” (I don’t know about the Earl, but historically being in charge of who pays how much in customs down there at the docks was a very rewarding profession); in money lending; and in the slave trade. Yeah. That unearthed info makes me see the lavish display of wealth (and aristocratic power) in an even less sympathetic light. Methinks scruples and wealth frequently have an inverse relationship; the pillars of capitalism do not rest on a moral foundation. I confess I have great admiration for Bill Gates, however he has decorated his house – he seems to be trying to do good. For most of the 1% – couldn’t you get by on maybe just 500 pieces of Sèvres porcelain? I offer a small apology regarding these ruminations over wealth. Wealth does divide us. I must say I’m content with my middle-class life. Yet somewhere in my head there is a notion, right or wrong, that great wealth also comes with greater responsibilities; there is a greater chance for impact. When the incredible wealth of a place like Harewood slaps you in the face with its extravagance, it’s hard not to see it as, sadly, simple narcissism and lost opportunity. Next post – the incredible city of York (and no philosophical meanderings). The Royal Armory Museum was moved here from London. 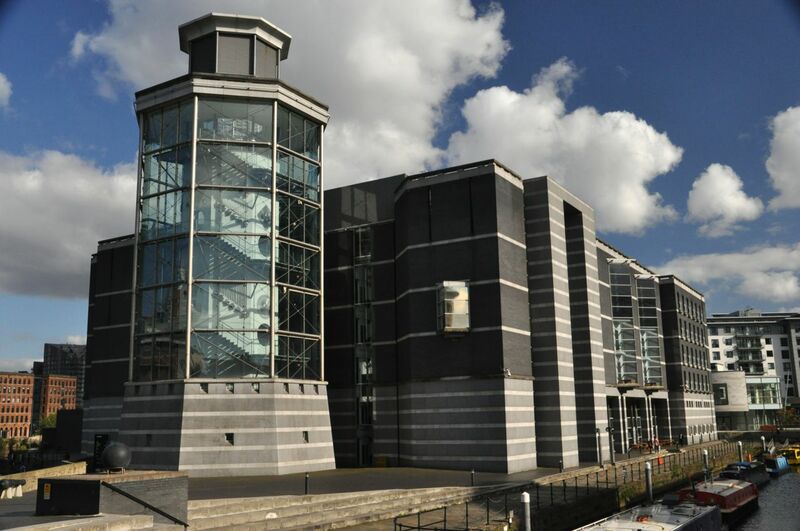 It’s located away from downtown Leeds, across the river but still within walking distance. It’s not small, as you can see. Still, we thought we could view all the interesting stuff in an afternoon. Boy was that wrong! We spent another entire day, and did not see it all. It contains a history of the world’s weapons and armor – almost always the real McCoys! There are Roman artifacts, lots of medieval armor from throughout the world – the UK, Japan, India … the only elephant armor in existence … jousting armor worn by the Holy Roman Emperor Maximilian I, ditto for Henry VIII, etc. knees. One large lion head forms the top and back of the helmet. The intricate decoration is applied gold. Apparently the armor was not just ceremonial but was used in combat, as suggested by the sword cuts on the helmet’s left side. Armor became not only protective gear in battle, requiring technical expertise in its manufacture, but also a fashion statement, requiring the skills of the best craftsmen in Europe. National styles developed; for instance, the high point in style (‘Gothic’) came from Germany in the mid 1400’s, with ripple-like fluting imitating the darts and tucks of contemporary dress. Many suits of armor were in color (eg, sky blue), but only traces of the original color remain after all these years. A little different from the shiny metal armor we thought, eh? The Armory had room after packed room! The displays were arranged around countries and themes (Japan, jousting etc.) rather than chronologically. I was interested in the temporal development of the weaponry and armor throughout the world, so I’ve tried to organize what we saw accordingly (but let’s be clear, this is only based on the Armory’s collection, and I am far from an historian). Let me also be clear – this is a looooonnggg post, wading through changes in history that will not be very compelling to many; you may find it useful to just skim through the pictures and wait for the next post! I’ll start with Bronze-age armor. The knowledge of how to make bronze disseminated slowly from the Middle East, where it originated. It didn’t find its way to Britain and into armor and weapons until much later. 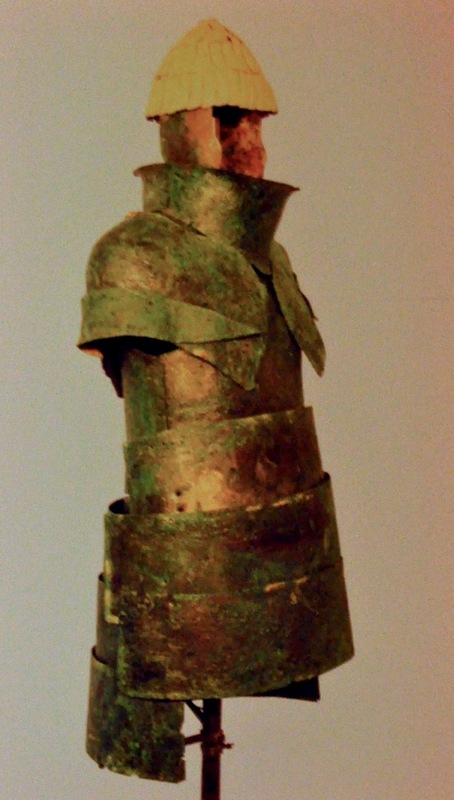 And since this is the UK Armory, very early weaponry and armor, such as this bronze armor from Greece (1400 BC), are presented only in pictures. These bronze plates would have been worn by a charioteer during an age when light chariots were the mainstay of armies. Later, armies were primarily composed of infantry spearmen, with shields and helmets. There was a lot of variation in the design of helmets and shields across Europe and Asia. for the next 300 years. The Armory owns the Corinthian helmets shown above (650 BC) as well as the Italian bronze armor (400 – 300 BC) that was used by infantry and calvary (above, right) – hence the reflections and fuzziness from photographing through glass cases. 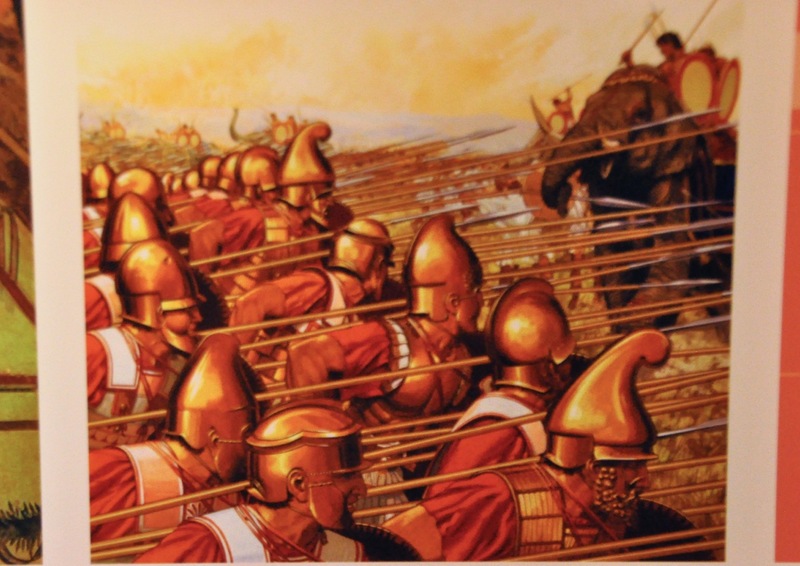 Next we enter the time of Alexander the Great: the infantry, which charged and fought in a deep phalanx, was armed with long spears wielded with two hands; the cavalry charged with lances rather than throwing javelins from a distance, and were all but invincible. And then came the Romans! Their armies morphed from infantry with spears to infantry with javelins, shields, and knives/short swords designed for thrusting in close quarters. horse led full-gallop charges to break through infantry formations (above right). Note the emerging appearance of the armor of Medieval times. With the fall of Rome came the Dark Ages, and for Britain that meant an influx of Saxons (Germany) and Vikings (Denmark, Norway, Sweden). Castles were needed! So were historians, but alas, they were not in vogue, simple survival being more important. I can only pull together bits and pieces from AD 400 to 1000. The Saxons usually fought as a “shield wall”, dense lines of spearmen carrying large shields, supported by light infantry and limited cavalry (who dismounted for battle). The raiding Vikings had shields, axe or sword, helmets and mail shirts. 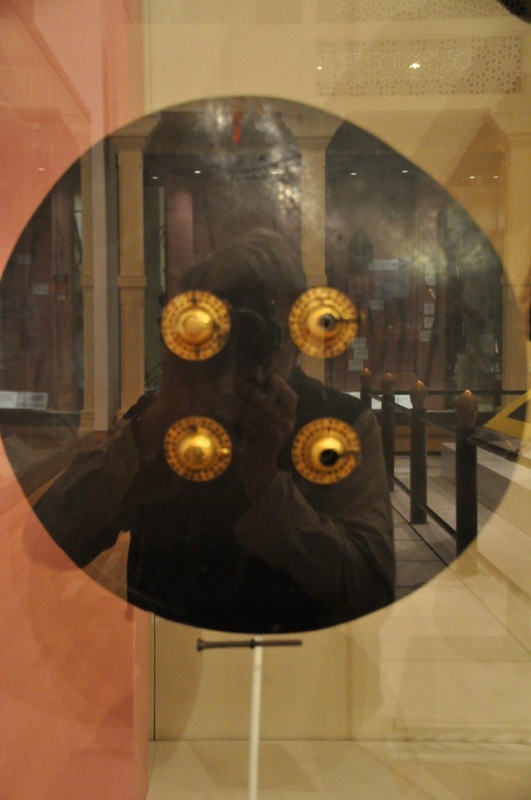 The picture to the left is a “star helmet”, Italian, 500 AD, named for the radiating straps of the framework. Introduced from Asia, it became a European standard for over those 600 years. Other helmets from that 600-year-period are shown below. 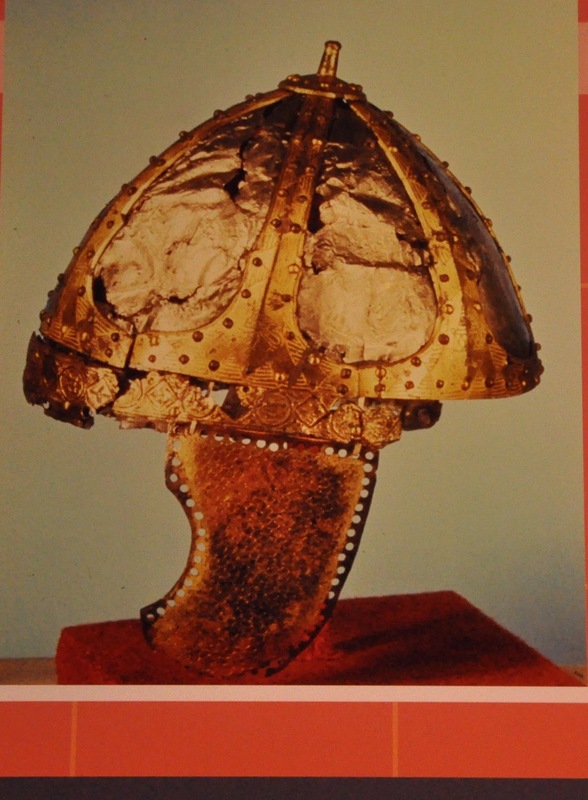 The last helmet is in the Armory; it’s made of 4 iron plates covered with gilt copper, silver rivets, and originally had a silver band around the base. Europe for the next 4 centuries, and it is from this period on that the Leeds Armory starts to show its true gems, no longer relying on pictures from elsewhere. Interestingly, it includes armor from all the known world. I should point out that taking photos was tough! The lighting was often very dim, my autofocus would not work, and there were reflections from the glass cases. You must forgive the following poor performance. We’ll start with a Mongolian helmet from the 1200’s, decorated in silver overlay of stylized Chinese lions and (Buddhist) priests. This type of helmet was used from the 800’s to the 1300’s in Asia. Notice that armor was art! If you’re going to die in battle, look spiffy! Or was it to make the ladies swoon? For me, seeing this armor gave a new perspective on warfare and the times. The Far East was of course not a stranger to warfare; sadly, war seems to define humanity. This armor would be worn by a mounted Japanese samurai from about 1300 AD. Only a few of the originals survive – this is a valuable exact copy of an original in Japan, incorporating some parts from that time. We move now to the more plentiful displays from the 1400’s and later. 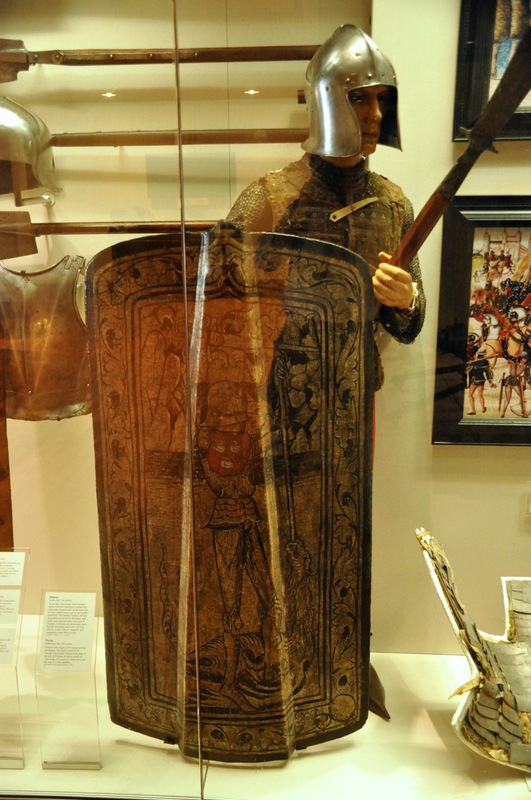 Let’s stay with non-England: the (real) armor below is from a Turkish heavy cavalryman from the late 1400’s. Mail and armor for man and horse are standard; the cavalryman carried a bow, sword, and sometimes a lance, the usual armaments of all medieval Islamic armies. 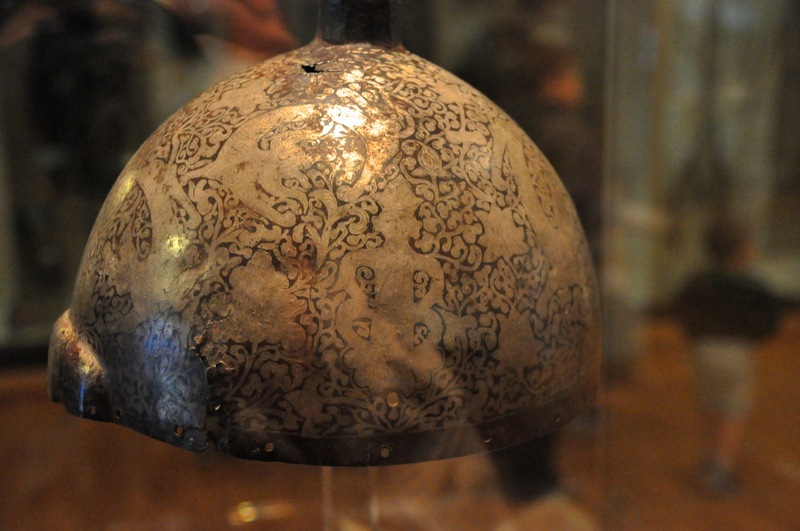 The helmet on the right is also Turkish, decorated with calligraphy, in gold and silver. 1420, made for presentation to a Tibetan monastery (where it was kept in good shape). 1200’s into the 1600’s, when it was replaced by mail and plate armor. 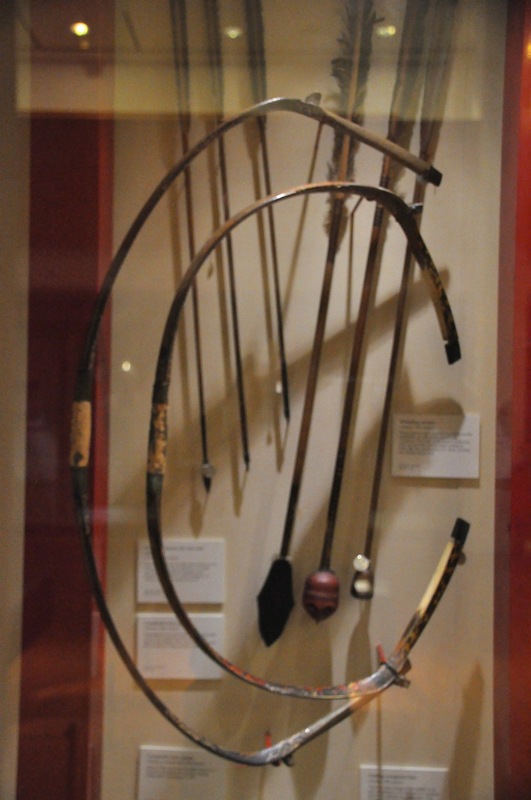 The Mongol’s principal weapon was the composite bow (shown on left), but many had lance and sword as well. The late 1400’s (the time of King Richard III of Shakespeare fame) is a strength of this Armory – a time when knighthood flourished. Knights were hired guns (on horseback) of lower nobility, who were paid with titles and land grants. They formed the basis of most early medieval armies, along with the knights’ vassals (spearmen and cross-bow men) who were paid in land use (and pillage). The earlier Norman mail evolved to plate armor, with impressive craftsmanship combining technical effectiveness and elegance. National styles emerged in Europe, with Germany’s “Gothic” style (with ripple-like fluting reflecting current fashion) and Italy’s smooth rounded plates leading the way. The armory has a significant collection from this time period. Examples are shown below. The ornate, sophisticated armor of the knights can be contrasted with that of their vassal soldiers, as illustrated by this Bohemian (now the Czech republic) spearman shown on the left. 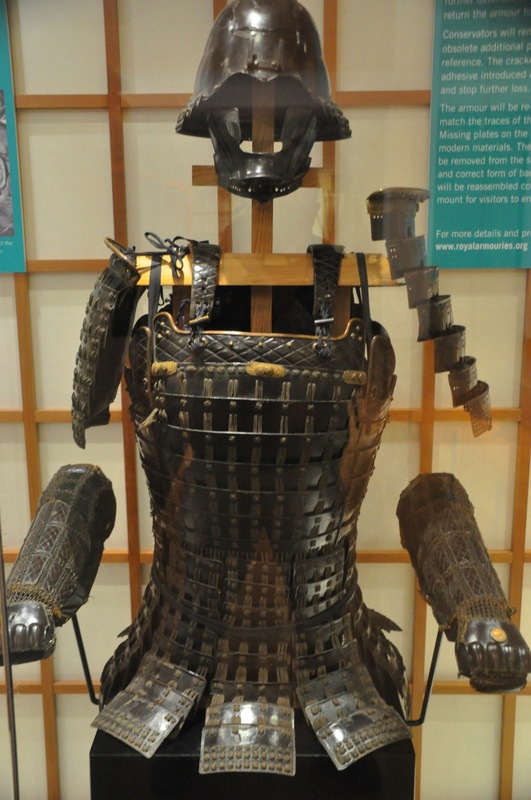 By the mid 1500’s, Japanese armor had evolved significantly from the crude iron plate of the 1300’s that was shown earlier. A sophisticated lamellar style of armor using iron plates that were lacquered black (picture on the right) emerged. Although there are some obvious similarities, this Japanese armor makes quite a contrast with the full body armor of Europe! Below are shown weapons from various countries, from about 1560. Some other examples of armor from the mid 1500’s are shown below. This suit of armor is believed to have been dark blue and gold. During the 15th and 16th century jousting reached a peak of popularity. These were extreme and lavish sporting events bringing competitors from far and wide, organized to show royal or noble power. Contestants, separated by a wall to prevent collisions, passed each other on the left side, so this side of their armor was more heavily reinforced. The armor was heavy but only worn for short periods. The jouster was locked in facing forward and the helmet was bolted to the breastplate to prevent the head from being forced back by a blow. Like regular armor, there was a German style and an Italian style. Examples are shown below. the early 1600’s, was still in use when captured in 1799. And the body armor, worn with shoulder straps, would make a Roman soldier cry. What India did have, was a cavalry – shock troops – of elephants. This is the only surviving elephant armor in a public collection, worldwide. The armor of Japan and China were quite different in the 1600’s. 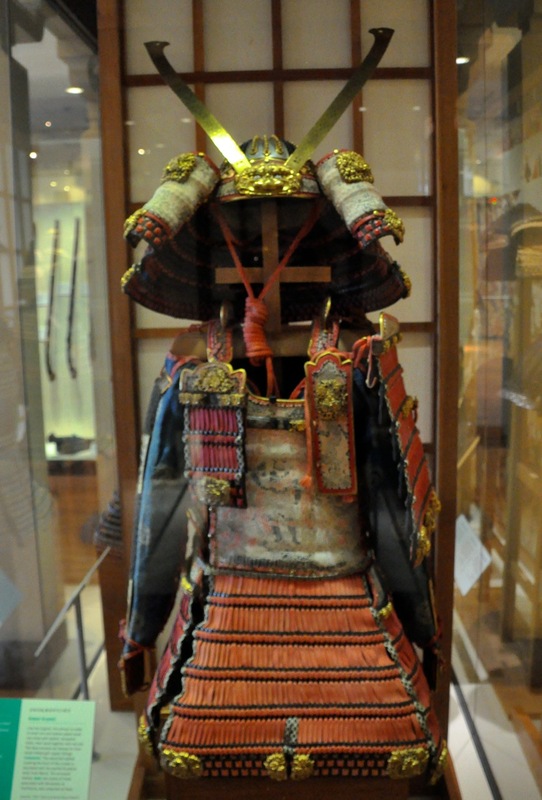 The Japanese armor of 1613, shown below, has small lamellar plates covered in cloth. The Chinese armor more closely resembles the clothes of the time and is similar to armor called “brigandine” in Europe. It consists of a jacket of heavy fabric with separate sleeves, covered with embroidered silk and lined with numerous small tinned iron plates fastened by gilt rivets. To this were added ornate shoulder guards and leg defenses. This type of armor became the most common type in China during the Qing dynasty (1644 – 1912). I would be remiss if I did not speak of the Chinese influence on warfare – principally via inventions of the crossbow and, of course, gunpowder. One of the great innovations in military technology was the crossbow, and in particular the cast bronze lock mechanism. Excavated examples of early forms date from the Han period of Chinese rule (200 BC – 200 AD) (!!). 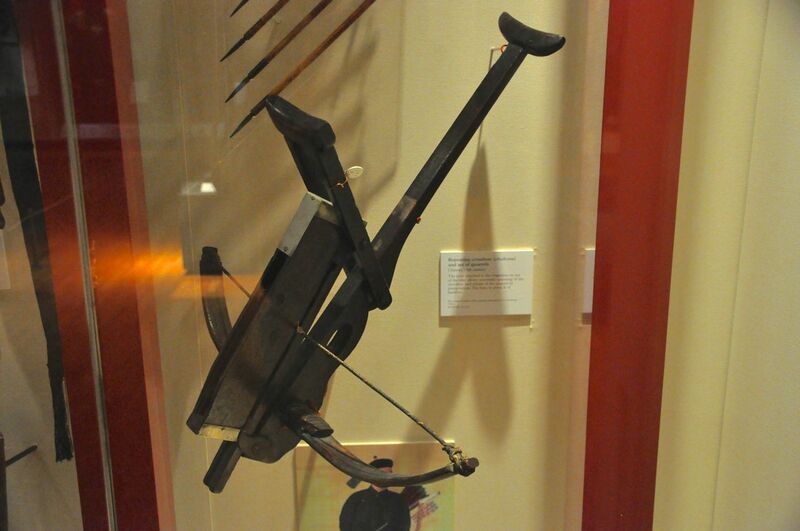 The crossbow continued to be an important weapon in China until the 1800’s. Alas, I only took pictures of this intriguing weapon, the repeating crossbow from China, from a later date, the 1800’s. The lever attached to the magazine top worked the crossbow by pump-action. Gunpowder was a true revolution in warfare, but it took a while to become effective. The recipe for gunpowder dates back to 600 – 700 AD in China, although its adoption for military purposes came much later; 950 AD saw it being used in an exploding arrow and as a fire-lance, the immediate ancestor of the gun. The fire-lance was a bamboo tube mounted on the end of a long pole and filled with gunpowder so that when ignited, it spat out flame. Later versions added fragments of metal or porcelain or arrows. The metal-barrelled cannon also came from China, cast in bronze about 1288 and in iron in 1338 AD. Cannon were originally mounted on four-legged benches; wheeled carriages were introduced between 1300-1350 AD. The “Silk gun”, above right, is bronze, bound with fiber and covered in silk. Light and portable, these are often seen mounted on four-legged benches in Ming dynasty battle scenes. Next we’ll look at examples of armor and weapons from Persia, India, China and Japan during the 1700’s. Persian armor at this time still has simple hinged torso panels, 200 years after the development of fitted suit armor in Europe! The formidable-looking axe was designed to penetrate plate armor and mail. Indian armor has changed considerably from what we saw in the 1600’s, as shown in the pictures below. This type of armor was introduced to the Islamic world by the Mongols in the 1200’s. The first picture above demonstrates the combination of quilted cotton fabric, mail and plate. The remaining armors use multiple layers of cloth sewn tightly together and covered with a rich material, usually velvet, and decorated with patterns of small gilt nails, giving them the name “coat of a thousand nails”. Large steel plates are set at strategic places. By the late 1700’s Indian armor had changed again, reverting to a style much like that of the 1600’s (below). By this time a large proportion of north Indian cavalry were armed with firearms such as matchlock muskets; perhaps the armor reverted in response? the armor based on the practical styles developed during the Japanese civil wars of the 1500’s. Note the similarity with the armor of 1613 shown earlier. Similarly, there is little change in China’s lamellar armor, shown below. The first image shows armor for a cavalryman (1736-1795) consisting of a sleeveless vest of embroidered cotton lined with tinned iron plates, shoulder guards, a groin defense, and defense for the legs. Note the visible overlapping iron plates on the leg recalling earlier lamellar armor. The next image shows typical leather lamellar armor from western China, also from the 1700’s. The rawhide is heavily lacquered. Similar leather lamellae have been excavated in China from 500 AD (! ), demonstrating the long period of use of this form of armor. A surviving photograph shows this coat still in use in the early 1900’s! Finally (finally!) we end this study of weaponry with the early 1800’s. I find it amazing that this type of armor was still being used, although the examples in the Armory were from Persia and India. The Persian armor is similar to that of the 1700’s, as shown below. The armor of India seems even more regressive, although the weapons are incredibly ornate. One interesting weapon from India is this pistol shield from the mid 1800’s. The 4 pistols built into this shield were discharged two at a time by means of two triggers – after the muzzle covers were manually lifted. The accuracy was apparently poor, and best used with the shield touching or almost touching the opponent. Wow! This post was a lot of hard work, extracting the evolution of weapons and armor from what’s available in the Royal Armory. If you are still reading this oh-so-long post, my hat is off to you! I did find the toil to be nevertheless interesting – hope you did too. Next post – and last from Leeds – the Harewood mansion, a masterpiece of Georgian architecture, but even more, a mind-boggling view of aristocratic extravagance. Welcome to the UK! Following our New Zealand adventures, we’re starting off our UK exploration in Leeds, England. Why Leeds, you ask? Ah, yeah. Good question! The adventurous life can have interesting twists. We signed up to do a house-sitting there, but the house turned out to be a filthy, unlivable disaster! We barely dodged that bullet. I won’t bore you with the story, it all worked out, but lesson learned: get lots of pictures before committing! So here we are in Leeds, which is apparently NOT a city that attracts a lot of tourists – we were continually asked “Why are you here?” by locals. Yes, Leeds is overshadowed by nearby York (we’ll get to York in a future post! ), but we found the Victorian architecture wonderful; the Royal Armory (moved from London) surprisingly captivating; and a visit to the nearby manor Harewood (still home to an Earl and Countess) fascinating, with its insight into the jaw-dropping (and shocking!) display of aristocratic wealth from the late 1700’s to the present. It’s too much to cover in one post, so I’ll start just with the city itself. Let’s begin by looking at some buildings! These pictures will give you a very small taste of the marvelous Victorian architecture here. That last picture is of Whitelocks, the oldest bar in Leeds (licensed in 1715, rebuilt in the 1880’s and extended into the row of Georgian working men’s cottages). Surely I can’t describe an English city without showing you an English pub, right? It’s delightful, with stained glass windows and a copper-topped bar. The beer isn’t bad , either! Back to our buildings: the exterior detail (on both new and old buildings) is impressive (see below). Lots of flourishes! The Corn Exchange is an amazing building, built in the 1860’s as a clearing house for the sale of grains in England and Scotland. It had 170 trading stands and continued strongly into the 1950’s. Of note is the amazing design of the roof that allowed uniform (northern) light for the careful inspection of the grains. Today it contains specialty retail stores. 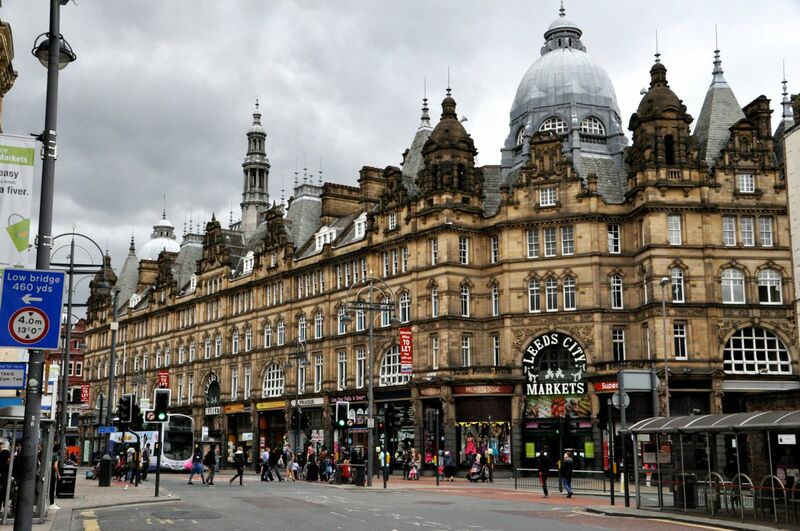 Although lacking in historical impact, Leeds leads in shopping – apparently second only to London. The shops are indeed impressive, both Victorian and modern. The Victorian arcades are especially captivating, as shown below. The modern arcade is impressive as well. In the Victoria Gate Arcade there were two huge window displays of antique sewing machines that we found very interesting. Fancy decoration! The city market is located in a very impressive building with an equally impressive interior; the food displays are a riot of color, combined with jostling but polite people and barkers hawking their wares. I was particularly caught by the seafood on display. The images below are just a peek. The Leeds Art Gallery was a disappointment, the art collection being surprisingly small. I was impressed with an artist I had never heard of, Christopher Nevinson, a “Futurist” painting during World War I; examples below. 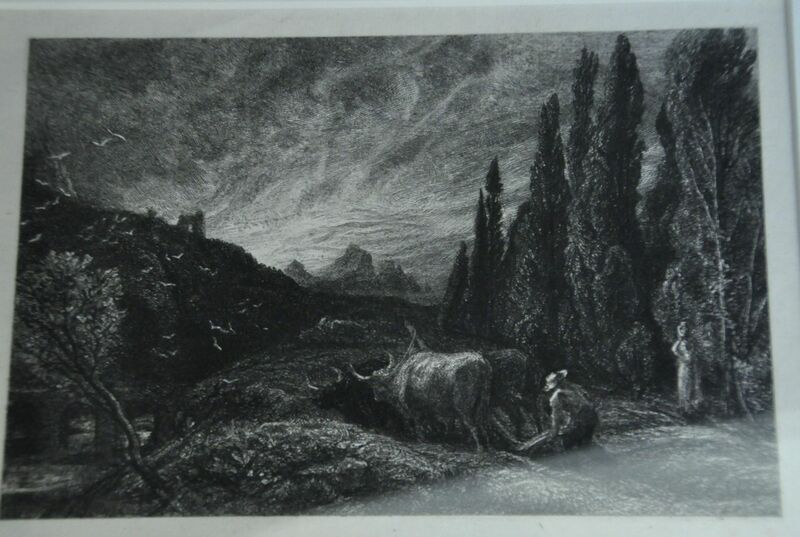 Another gem was this engraving, but alas, I missed the artist. The real art in the art gallery was its coffee shop, an incredible room of tile and decoration, shown below. Around the room, high up, were busts of famous authors of the UK (Burns, Scott, etc.) and others more ancient (Homer, Dante). images, indicating the mixed nature of 10th century society. That’s it for the city of Leeds itself. OK, it’s not a tourist destination, but for us that was part of its attraction; it’s a normal UK city, attractively going about its daily life, yet for us newcomers to the UK, impressive in its old roots. Next post, the Leeds Royal Armory Museum.